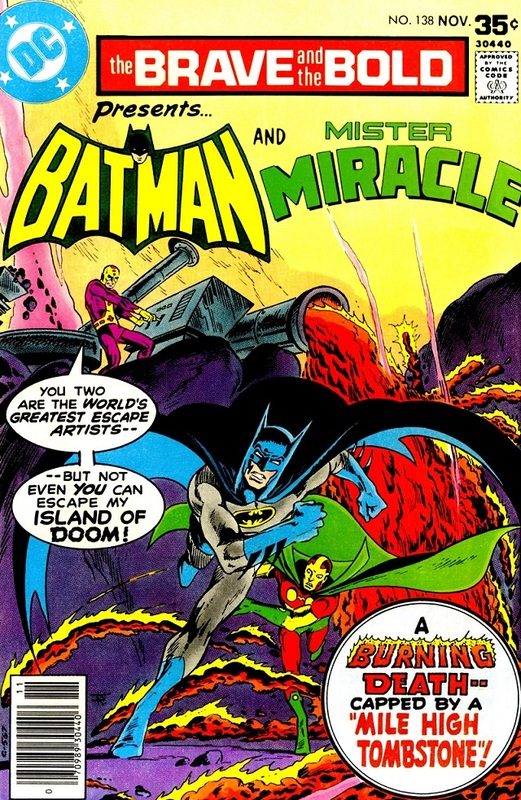 On their way in, they encounter Lang's pick and Mister Miracle barely saves Batman from the booby trap. A bit later, the villain finally reveals himself. He is Cosimo, perhaps Batroc's younger, mustache-less cousin. He holds the heroes at gunpoint and reveals he's been retrieving the devices Scott used as bread-crumbs on their trail inside the facility. Clear proof these two have to be cousins or something, amirite? Batman and Mister Miracle (of course) escape. Scott explains to his ally that Cosimo was an acrobat and escape artist in his own right, one with a mad on for Mister Miracle because of all the lost competitions he suffered at Scott's hand. This comic may present Batman in his most unflattering light, as he stumbles quickly on yet another death-trap which Mister Miracle saves him from. Cosimo attacks again, but the heroes almost waylay him instead! The villain uses his own escape artist skills, focused on passage through narrow tunnels, to slip through a crack hard for the heroes to follow. The heroes find Steve Lang around the bend, but he appears to be hypnotized. He can only say one word, the same word he called them with by radio: "Kraken." As Batman and Scott Free struggle to understand the clue, they're caught in Cosimo's net and captured! Cosimo gloats as the heroes struggle to free themselves. Satisfied in his victory, Cosimo calls for Kraken, apparently the man in charge of his plan. Kraken gives him the path out of the volcano through a radio signal. But Scott appears outside the net and threatens the villain. This causes the villain to release his grip on the net. The two heroes spring out from inside it! Mister Miracle hadn't been outside at all! The heroes strike, but again Cosimo slips away! Batman asks Miracle how he did it and Scott gives him a simple, pat answer: hypnosis. The chair that holds the catatonic Steve Lang also has a radio and they use it to follow Kraken's signal. They quickly fall into another sand-blasting death trap. Though they cling on for dear life, they take Cosimo for dead, killed by his boss after his failure. Steve starts to wander off, spouting about the "Kraken this way!" The heroes follow, knowing the mystery villain is their only hope of escape. They stumble upon a cave of vast treasure and the Kraken! Only their enemy is no man, but a giant super-computer! All computers need to have a literal dragon with tentacles atop them and so us blogger types could be 1000 times cooler. Batman reveals that the island has long been the headquarters for Kraken, dating back to Viking raiders. But in order to operate with utmost secrecy, they needed a leader with greater security and mental acuity than any one man, so the Kraken computer was born! Lang hand found it and Kraken assigned Cosimo to drug and kill him. The heroes' interference saved Lang's life and exposed the Kraken! But even as the heroes realize the plot, a silent figure in Corsica watches them on a monitor. He activates a failsafe and the Kraken starts to build towards an explosion! They barely escape, but the tunnels are crumbling around them. 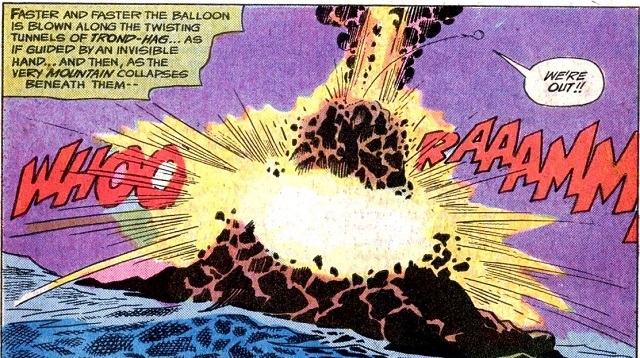 Mister Miracle uses his cape to make a hot air balloon of sorts. The air currents in the cave carry the three men upwards and free of the deadly caves at last! Batman reveals that he'd apparently known Kraken was a computer all along. His own satellites were pulling out every ounce of information the Kraken held, much to the chagrin of the veiled crime boss in Corsica. The heroes celebrate their victory, but both have much more work to do. Batman will bring down the crime ring once and for all. While Scott has his war with Darkseid and Apokolips to continue! This explosive denouement is also an apt illustration of my brain after trying to run down this story for you. Thus the story is quickly wrapped up in the typical Haney fashion. Much like his first use of Scott Free in the pages of Brave & The Bold, this issue offers a convoluted plot way too complicated for its 17 pages. So much of this book feels like panels are missing. In places it feels like it might have been written Marvel style with Aparo doing all the layouts and plots and Haney just trying to script it through (and failing rather spectacularly.) Yet if this was artist driven, it feels like it gives Aparo little room to shine as we get few really impressive shots of either hero. Overall, this was a fairly run of the mill issue of Brave & The Bold, and the weird Haney-verse it existed inside. But as a chapter in the life of Mister Miracle, it falls even flatter than his previous two appearances. Mired in his war with Darkseid, it seems all too strange for Scott to even be involved here. Yet the comic acknowledges the fight a few times, even as he stops to help Batman simply find a lost friend. Cosimo's disappearance is especially egregious, as we're left with just some dialogue lines to tell us he's surely dead. Since this was the character's only appearance, I guess he was. I'd rather think he was sent through whatever trans-dimension portal he first came through, grew out his mustache again and ran off to fight Captain America yet again. Next time around we continue our Mister Miracle triptych! See you next Wednesday!